Who is excluded from this version of a public sphere? Whose voices are not heard? Whilst the content broadcasted on QandA is controlled, the issues that are discussed are broad and current enough to still allow for political action to arise in a wider public sphere. 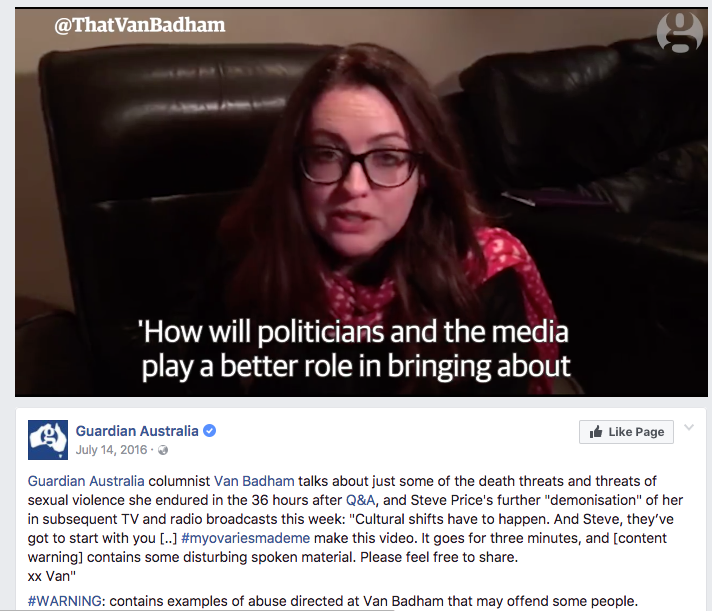 The above clip features an excerpt from QandA which prompted direct responses across many social media platforms. The issue of domestic violence is explicitly being discussed, although a further issue of societal attitudes towards women becomes apparent as the deliberation between Price and Badham draws on. 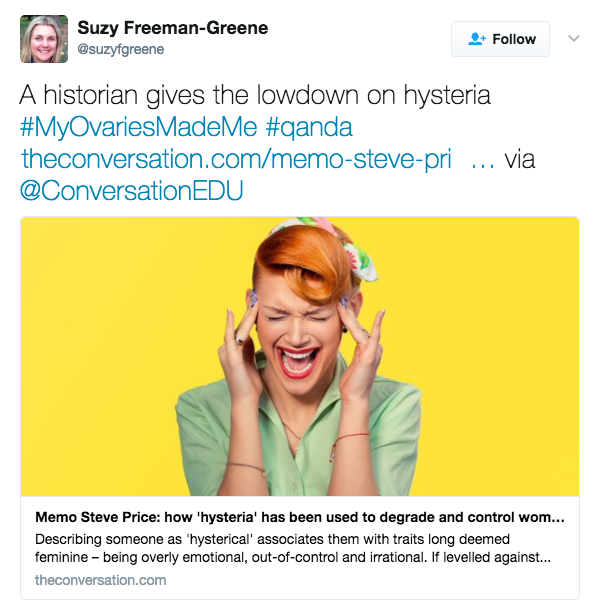 Within the immediate public sphere of QandA, neither side of the ‘argument’ seems to be silenced, however Price’s use of the word ‘hysterical‘ continues an age-old attempt to silence women’s opinions. The original issue was a remark made by Eddie McGuire on Triple M which sparked outrage due to its ‘sexist’ nature. 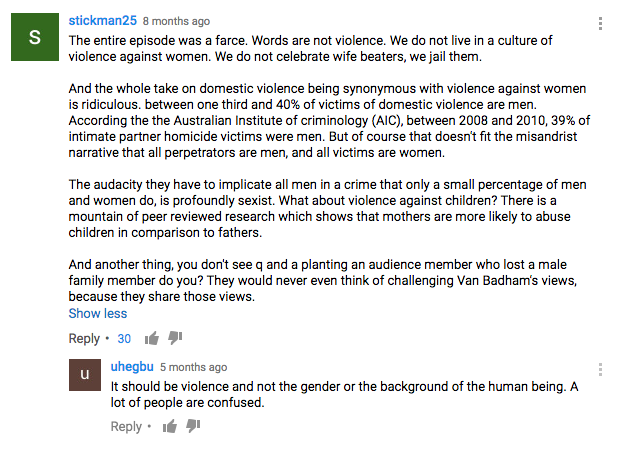 Badham’s later argument on QandA reflects issue of the legitimisation of so called ‘boys banter’ (evident by Steve’s defence of McGuire) which is reflected in the normalisation of domestic violence in Australia. Although the discussion of women and gender equality is a widely discussed media issue, it is not uncommon for events such as this to prompt direct responses from the public. Thus, this particular debate had news agencies and the public alike buzzing about the issue, evident in the running of many stories, and airing of further debate, as well as widespread social-media outrage. 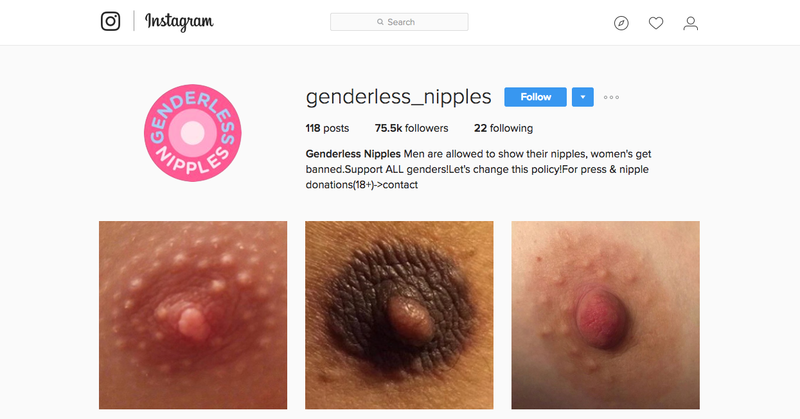 Social media is possibly the most inclusive public sphere, as it allows anyone and everyone to chime-in on what they believe to be true. 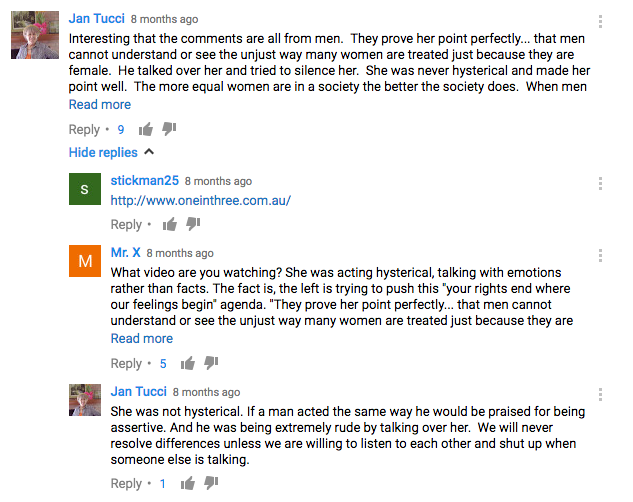 For example, a quick scroll below the embedded video allowed me to witness further debate on gender equality and domestic violence. Here are some of my favourite responses (click the image to enlarge). But comment threads are not the only platform for debate. 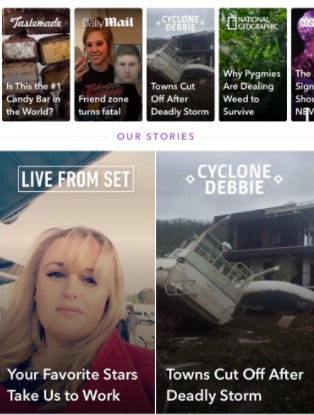 The Price v Badham issue cropped up on Facebook, and Twitter (#myovariesmademe), whilst issues of domestic violence and gender equality even found their way onto Snapchat’s news feature, and Instagram. It is very interesting to consider the ways in which the notions of a public sphere have changed since Habermas’ original 1962 theory. A debate that began with McGuire’s ‘boys banter’, was continued on QandA, all the while being discussed across social media. So, the public spheres for deliberation about gender equality and domestic violence were seen to morph and change – according to where they were being discussed. In some places, like QandA the discussion was mediated, whilst in others, such as on social media, voices within the discussion were more omnipresent and uncensored. Do you think our public spheres are now wider and more accessible? Turbull, S 2017, ‘The Media Theory Toolbox’ Powerpoint Slides, BCM110, University of Wollongong, delivered 26 March 2017. It is interesting to consider that the Q & A panel is mediated, but in my opinion, it does not make it less uncensored. The reason I say this is because the panel are chosen specifically in order to cause conflict between different members. 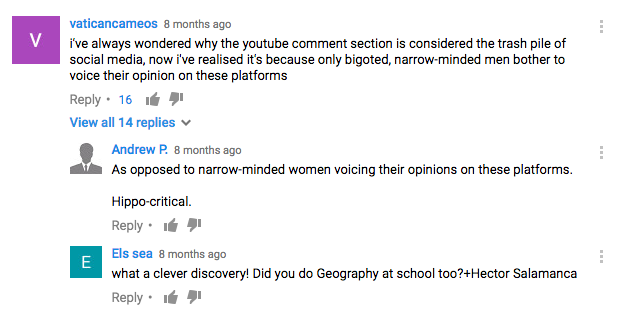 If the conversation was censored, the argument would not have taken place would it..? Or at least, Price’s personal attack by calling Badham ‘hysterical’ would have been omitted.